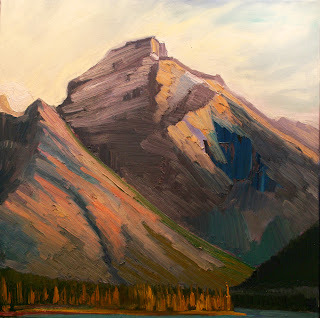 Banff and the Canadian Rockies makes it apparent when plein air painting that, "Place" or the setting in which you are painting makes for better paintings. The Banff area of the Canadian Rockies has been painted by the famous and not so famous for a century. At the Whyte Museum in the town of Banff, I picked up some exceptional books on just that subject. 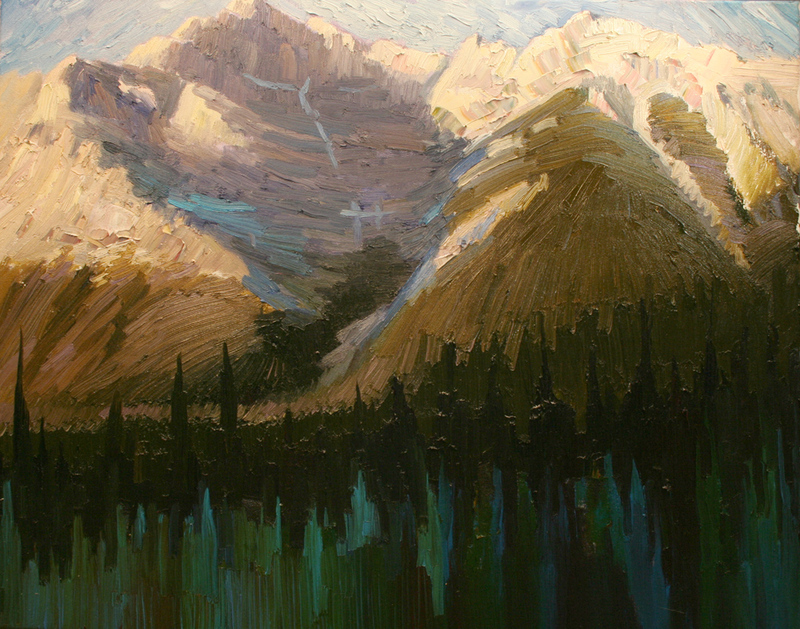 Lisa Christiensen, assistant curator and hiker, has written "A Hiker's Guide to Art of the Canadian Rockies" $29.95, ISBN 1-894004-39-6, complete with paintings, maps and local information on exact places artists such as Carl Rungius, A.C. Leighton and the Group of Seven Painters, J.E.H. 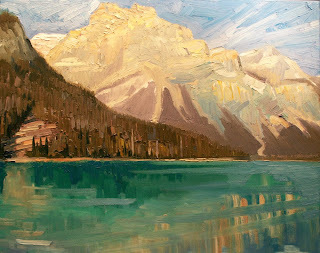 MacDonald and Lawren Harris stood to paint 'en plein air' at Lake O'Hara, Lake Louise and many, many other wonderful places. These books are indespensible to the plein air painter, saving many hours of searching for good painting vistas. Many of the places they painted can be accessed from your car but many can only be got to by hiking or helicopter. The Canadian Rockies are exceptional with regard to accessibility and convenience. Canadians have allowed guides to build lodges in the back country. Mountain climbing and heli-skiing have been a tourist industry for some time. Aside from the wondrous panorama's available to painters there are easy opportunities to observe wildlife. We saw mt. goats, mt. sheep, bull elk, bull moose, cow moose and calves, coyote and a silver back grizzly. You have to keep an eye over your shoulder when you have your nose in your paint and pepper spray wouldn't be a bad idea. A paint brush doesn't make a very impressive deterrant. Maybe a can of paint thinner placed on the tail? I look forward to returning. September is the best as the Larch and Cottonwood are turning. Earlier in the year such as spring or early summer and you may find too much snow. It was 28 f when I was there in October. Glad I took my warm clothes. It did warm up to 45 during the day. One thing we did find is that Canada is down for maintenance after their Thanksgiving, second weekend in October. Many of the trails and activities were closed. It was so bad we joked that "even the sun is down for maintenance" it was so cold.